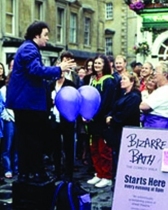 You'll laugh yourself silly when you join the celebrated stroll which takes an irreverent look at the city of Bath. You''ll experience unforgettable mysteries, thrills, and surprises that stretch the traditional image of the city. So if you're looking for something hysterical rather than historical, why not join us? No booking required - pay on the day.